Ever since his appointment as music director of the Pittsburgh Symphony in January 2007 Manfred Honeck and his orchestra have produced a number of highly acclaimed recordings, first for Exton and then, engineered by Soundmirror, for Reference’s FR series. Among the former is a Mahler Fifth that I described as a ‘nearly, but not quite’, and among the latter a Bruckner Fourth that started better than it ended. So, not exactly a ringing endorsement, but then several of my colleagues have been far more positive about these and other Honeck releases. 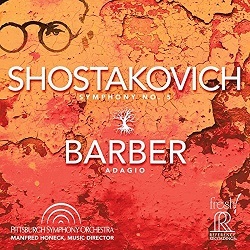 Of course, there’s plenty of competition in this, Shostakovich’s most recorded symphony. Perhaps the most astonishing discovery was Kurt Sanderling’s 1982 recording with the Berlin Symphony, remastered and reissued by Berlin Classics. It’s one of those paradigm-shifting experiences that forces listeners to revise their expectations of a seemingly familiar score; unsurprisingly, that album was one of my top picks for 2016. Not far behind is Andris Nelsons’ recent Boston recording, part of his ongoing Deutsche Grammophon cycle. In my review I wrote that ‘behind its public clamour lurks a reading of remarkable intensity and insight that’s … quite overwhelming’. Then again, this is one symphony that should never leave one unchallenged or unmoved. The catalogue is stuffed with other fine recordings of this remarkable piece, ranging from Kirill Kondrashin’s gripping, highly idiomatic account – part of his seminal Melodiya set – to Mark Wigglesworth’s less febrile but no less satisfying one for BIS. I’ve also rediscovered Vladimir Ashkenazy’s RPO Fifth for Decca; I prefer it to his Signum remake, which burns with a much lower flame. Then there are two splendid videos from Euroarts: Leonard Bernstein with the LSO in 1966 and Yutaka Sado with the Berlin Philharmonic in 2011. Both are volatile, but there’s plenty of insight and imagination mixed in with the excitement. I’ll be perfectly honest, I had misgivings about Honeck in this repertoire, which demands the conductor dig deep in order to unearth the music’s extraordinary originality and strength. Alas, Honeck is brisk and fatally detached in the opening movement, and although his timings might suggest otherwise there’s an alarming sense that Honeck has a pressing appointment elsewhere. In short, he barely scratches the surface, and the bright, steely sound – particularly in the upper strings – is something of a turn-off too; not at all what I would have expected from the usually excellent Mark Donahue. And it doesn’t get any better. There’s little evidence of dramatic contrast, of ambiguity and equivocation; indeed, there are times when I scarcely recognised this familiar music. Honeck is well-known for his very personal approach to a given score – his booklet essay, Shostakovich 5: Victory through Pain, is a case in point – but in this instance I feel he’s wide of the mark, and consistently so. The darkly evocative Largo counts for precious little, with absolutely no feeling for shape or idiom. And that implacable sense of approaching apotheosis, so vital in this symphony, simply isn’t there, the finale both rambling and rampantly rhetorical. In this context the thudding sign-off comes as a merciful release – but for all the wrong reasons. After an hour to reflect and regroup I listened to Samuel Barber’s Adagio for Strings, an arrangement of the second movement of his Op. 11 String Quartet. Starting with the death of President Roosevelt in 1945 it’s a piece that’s become synonymous with public mourning. The most convincing and genuinely cathartic performances avoid drear and dolour, something that Honeck and the PSO signally fail to do. At least the string sound isn’t quite so unforgiving, but that’s of little comfort in such a dull soundscape. Goodness, what a dispiriting album this is, failing as it does to offer anything new or worthwhile in either of these works. And while both are contemporaneous, they make exceedingly strange bedfellows. Ideally, something more apt and substantial should have been found to partner the symphony. In any event, an hour’s playing time seems pretty meagre. Remarkably dull performances of both works; the engineering is sub-par, too.